Years ago I started to collect unfinished embroidery panels. There was something sad about seeing a piece of fabric with hours of meticulous embroidery work that was never completed; today they're scattered throughout my house as wonderful accent pillows. 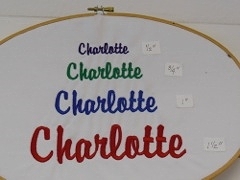 Send us your unfinished embroidered panel and tell us what fabric colors you want incorporated in your custom embroidery accent pillow available in two favorite sizes, 12x12 and 16x16 inches. In the example, I took a lovely embroidery crewel panel of honeybees in pink clover and turned it into a standard 16x16-inch sofa pillow backed with a complimentary solid green fabric. 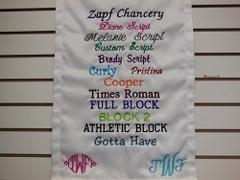 You can also have embroidered a name and date to make Custom Embroidery Panel Pillows into personalized gifts. If you need a different size, just let us know for a free, no-obligation quote.